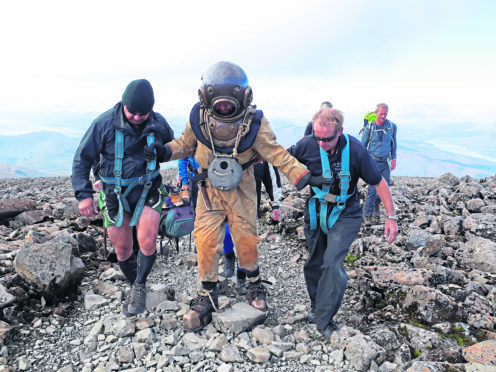 A team of divers have walked from the seabed to the summit of Ben Nevis while wearing a vintage diving suit - and in doubly quick time. A team of fundraisers who successfully scaled Ben Nevis wearing a vintage diving suit said they were “elated” on completing the challenge. The Seabed to Summit Challenge started 16 feet below Loch Linnhe with the diver emerging at the pier before a 2.5 mile trek to the mountain to begin the ascent. The idea came from Ginge Fullen who has climbed the highest mountains in 170 countries as well as also being a former Royal Navy Clearance diver. The aim was to do something that no one else had done so that “no one else would have to do it” while raising £1 per foot climbed. They fulfilled both ambitions, first by reaching the summit at 12.56pm after setting off on Saturday morning – a whole day ahead of schedule. And secondly by raising £4,825 – much more than the £4,430 target they set on the Just Giving page. They collected cash while on the walk both through Fort William and on Ben Nevis. The money raised will go to the Historical Diving Society and Lochaber Mountain Rescue Team, as well as to the family of Saman Kunan, the former Thai Navy diver who died while assisting the rescue of a football team and their coach in flooded caves. To make it to the top the fundraisers established a relay team with one member getting into the 176 pound diving suit every 328 feet. At night a couple of members would camp out on Ben Nevis with the diving gear and the others would head back to the Underwater Centre base that supported the team for free. Speaking yesterday, Mr Fullen expressed his admiration for the “fantastic” team who “gelled” despite not knowing each other before the attempt. He said: “We summited at 12.56 to be precise. Were we tired? Yes and no because we were on such a high – we were just elated at having made it. “We were elated when we reached the top because it was such an unknown – there was a couple of high steps and then it was all rocky at the top. It was a fantastic achievement I think.